I’m a bit puzzled as to why I had not heard of FIVE NIGHTS IN MAINE until I saw it at the Dallas Film Festival line up. 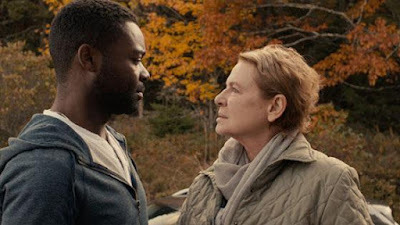 Here’s a film with David Oyelowo, Diane Weist and Rosie Perez giving some of the best performances of their careers and it’s just quietly chugging along on the festival circuit. Why aren’t trumpets blaring? The film has Oyelowo heading up to Maine to see his estranged mother in law after his wife is killed in a car accident. While you can guess how some of this goes, a great deal of this doesn’t go as expected with the result the you don’t feel like you’ve been here before. This is a wonderful little drama. What makes the film better than a mere little drama are the performances by the entire cast. Everyone in the film is perfect with the three big name stars taking things to just another level. These are not characters on the screen, rather they are real people up there and when they let go you feel it in your soul. I completely understand why Weist and Perez took the role and why Oyelowo acted as one of the producers because good roles such as this are so hard to find. This is one of the must sees at the Dallas Film Festival, or where ever you get a chance to see it. This is a true hidden gem of a film.